Dear Supporters of Elphinstone Logging Focus and the Save the Wilson Creek Forest efforts. The battle is not over and we are not going down without a fight to get Mayor and Council and SCCF and their local Board of directors to wake up and listen to the community in their cries to Stop the logging of this ‘jewel’ of a forest. To aid all of us in our efforts we are today announcing that Ed Hill, an artist in Gibsons, BC, has created an original work of art (Click Here to fully view – The Community Forest‘ ) from his last visit to the Wilson Creek Forest (SCCF cutblock EW002). From this visit Ed has created a painting, ‘The Community Forest’. 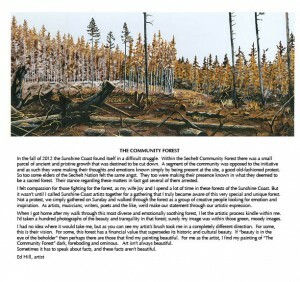 This work of art depicts the Wilson Creek Forest (a SC Community Forest cutblock EW002), a much loved and trailed old growth and natural forest close to Roberts Creek on the Sunshine Coast, after it has been logged by the Sunshine Coast Community Forest logging company. Unfortunately, if logging is not stopped soon it will end up looking like Ed Hill’s painting or much worse.